We invite readers to share their experiences and feedback on hoofboots. I’ve got a 7 yr old OTTB (reasonable feet, barefoot about a year now, I do ride in boots) and a 24 yr old ex-eventer Appaloosa who had all types of issues and is now very happily barefoot for the past 4 years. The TB has decent sized feet, although loves to try to stay run-under on the right front, has platter type feet and has worn the Old Macs and Boas. The Appaloosa has crappy feet, upright pasterns, basically tea-cups for feet and wears Boas quite nicely. They are both very happy with their boots. I’ve used the original Old Macs, the Boas and the new Old Mac G2’s. I love both versions of the Old Macs however they are a pain to put on. The Boas are much easier! I’ve found that the shape of the hoof makes a huge difference as to the type of boot that works for each of my horses. The type of riding that I do is trail riding (nothing severe), ring work, riding in fields and jumping. So far, I’ve been slightly more comfortable jumping in the Boas, only because they seem slightly less clunky than the Old Mac’s. The Marquis boot looks quite interesting but I don’t have $300+ to shell out on a pair. Love the idea of fully replaceable parts though. I’ve found that the biggest factors to finding boots that I’m satisfied with is proper fit and correct shape for that horses hoof. The boots that I use are the kinds that go over the top of the hoof. Someone recently mentioned the new Easyboot Bares which look quite intriguing as they do not go over the top of the hoof which, in theory, I think I like the idea of. I only use boots in front on the horses. SO far, they’ve managed to seem fine barefoot behind and it’s nice to save on shoeing bills! my mare has been barefoot for approximately 5 years now. during that time i had an opportunity to try various hoof boots and here are some of my impressions. Old Mac boots (the old style) – these boots seemed v. clunky on my little mare’s hooves. the straps rubbed her pastern and the flopping sound they made while we were cantering made me think that it couldn’t feel good to her either. Boa Boots – i next tried boa boots. they were a much better fit for my mare. she kept them on well (although she did manage to pull it off once or twice). they were easy to put on and easy to tighten. EZ boots – i really liked the ez boots EXCEPT we didn’t always keep them on. in fact, i painted my black boots with orange spray paint, so they’d be easier to find on a trail when they came off. i know people use them successfully and there are ways to keep them on, such as wrapping with duct tape but with the epics by easy care hitting the market, i decided to switch. Epics by Easy Care – i really liked these boots but she’d pull them off once in a while and i couldn’t figure out why since my friend’s used them successfully. turned out later, after i got rid of them, that they were too large for her. i cut the heel straps out of them and drilled a drain hole in the middle. the adjustments are just like those on an ez boot. they work well. the gaitors on the new model have a rolled edge to prevent any rubbing. they have a nice grip to them, too. Bare boots by Easy Care – these are the boots i’m currently using and they’re my favorite by far. you adjust them once and then you don’t have to adjust unless your horse’s hooves change shape. i cut the heel straps out b/c i found them impossible to pull up and she ended up actually standing on them. i use a rubber mallet to get them. it makes the job much easier. they’ve never come off! we’ve been riding in them since june over all types of terrain, jumping, mud, grass, sand and we’ve had no problems. the sole of the boot is shaped more like a natural shape of the hoof. i actually think that my only complaint about the boot is that it can be a bit slippery when galloping on turns in wet grass. i don’t know if the other boots experience the same problem since they didn’t stay on well enough for me to try galloping like a lunatic 😉 i rinse the boots after each use and flip the gaitors down so they dry in that position making it easier to get on the next time. EZ Care Comfort Pads – this product is my favorite. these comfort pads are made of some kind of rubber-like material. you cut them down to size depending what kind of boot and what size you use. the provide cushion for the horse. in my case, my mare had a bout of laminitis in april and she’s still a little sensitive on v. hard or rocky terrain. the boots themselves don’t resolve the problem. but with the comfort pads we can trot or canter on any terrain. it’s a great way for her to get the activity she needs during the recovery process. i hope you find these comments helpful. i also realize that this has been my experience with just my horse. she’s a small mare who had terribly contracted feet when i got her. her feet have expanded tremendously during the last 5 years but they are still not perfectly round. i think some of these boots fit certain types of hooves better than others. another good source for used hoof boots is the classified section on the endurance.net website. I would like to leave feedback on the Old Mac G2 boots. I have used these boots for some months now with tremendous success. My mare was victim of poor hoof form combined with suffering from Equine Metabolic Syndrome and often became laminitic and very sore on anything except the softest footing. The G2s have been a life saver for her and I both. Hoof form and diet have been addressed, but I feel that her feet will always be flat to some degree due to 10 years of improper foot care. That’s where the boots come in. They come with a pair of pastern wraps, which are essential for preventing rubs and irritation. There is a slight learning curve to using the boots, but you quickly figure out the easiest way to get them on. I do fairly intensive trail riding over varried terrain (mud, rocks, hills, water, grass, woods), and the boots have never failed. They offer superior traction and tread and my mare has never slipped or stumbled while wearing the boots. We have traveled at full out gallop through fields many times and my mare always felt very safe in the boots. Some users will file the tread down a bit, because it is so agressive. I never found a reason to though. The boots are extremely long wearing, and a garden hose and stiff brush is all that’s required to get them looking almost new again. It seems that the G2s are very round in shape, and would tend to fit the horse with a round foot. If your horse has long toes which are run far forward, you may have a hard time fitting these boots. The breakover of the boots is very fast, and my mare still lands solidly heel first while wearing them. It does not seem that they interfere with her proper way of going at all. I can’t say enough positive about these boots. They have been fantastic and I would highly recommend them to anyone. In general, boots that come above the hairline (Old Macs, Boas) are easier to put on but do not stay put as well as those that come to below the hairline (Easyboots, Easyboot Epics & Bares). However, I mainly use the Easyboot Bares and I really like them, because they stay put REALLY well, even running and jumping. I have schooled cross country in the Bares and they did not budge. I decided on the Bares with the encouragement of my farrier, who also fits other Easycare boots. The Bares are her favorites because they flex with the foot, and the bungee system that keeps them on is a firm but elastic hold on the hoof. She fits them quite tight for added security. These reasons were compelling to me so I decided to go for it. The other boot I would have considered is the Epic (the gaiters make a big difference in stability, I think), but it does not flex like the hoof. It also is not as attractive and low-profile as the Bare, in my opinion. The Bare is also shaped kind of like the bottom of a hoof but that wasn’t as important to me as having something that was protective and sleeker-looking. Unlike original Easyboots and Easyboot Epics, Bares do not have cleats. The Easyboots now come with optional cleat covers. You could also buy them seprately for $1 a pair from Easycare http://www.easycareinc.com/Other_Pro…cessories.aspx . The Easyboot Epics have a “permanent” cleat cover that actually can be removed, but it takes tools and a more complicated process. The Epics and the Bares are very similar except for the treads on the bottom and the fastening system (the Bares have an elastic bungee across the front of the hoof to keep them snug; the Epics have the familiar cable and buckle system). I also think that the sole of the Bare flexes more than the original Easyboot and Epic, but I haven’t compared them myself. I have had quite a positive experience with the Bares, considering my initial worries over whether I would be able to put them on. The Bares definitely have a learning curve for putting them on. My farrier gave me a tutorial on how to do it and then I did it in front of her. Basically, when the boot is very new it is hard to keep the gaiter out of the way as you put it on (this gets better as they break in). You work it over the widest part of the hoof and then let the horse stand on it to push the hoof in. Then I usually use a rubber mallet ($5 at Lowe’s) to tap it home into the right place. It has become easy. Traction has generally been at least as good as with metal shoes. I did one XC school in them quite easily. Then we went to a schooling event with some really slick footing and some sharp turns, and my horse’s hind end went out from under him on one of the turns. I do not know if he would have been able to recover had he been barefoot, but I do know that both shod and barefoot horses slipped around a lot on that course and of two horses that nearly fell around the same turn where we fell. Recently I did some trot sets in them and then galloped for a minute, and my horse was very comfortable. When I dismounted the boots were, as usual, still in the same place they were when I put them on. Oh, and one other thing about the Bares: they come in a silver cookie tin with a picture of a hoof on it. No joke! The Bares were not reviewed in the Horse Journal article of September 2006. I wrote to the editor and she said that they did not come out in time to be tested for the article. The article liked the Easyboot Epics the best—I wonder if they would also have rated the Bares highly, since they also stay on well and do not rub. Also, the Horse Journal article does not recommend any boots for jumping– I am not sure why. I called Easycare and asked them about jumping in boots and basically they said, “we won’t tell you you can jump in them, but we also won’t tell you that you can’t.” I guess they do not want to be liable for anythiing. Whatever you wind up getting, you can order some Comfort Pads from Easycare to put inside the boots and make your horse more comfortable while he transitions. I have used the half-thickness (6mm) Comfort Pads in my Bares before. Thanks for your review. I have tried almost all the boots out there and I am in search of the perfect boot. I have been staying with the easyboot glove but have found it gets sucked off in muddy conditions. I wonder if the bare would be a better choice in muddy conditions over the other easyboots? Hated the original easycare. Didn’t like the clips, didn’t stay on , etc. Loved my original Old Macs, but I wrecked them by loaning too many times to others where the fit wasn’t right. It worked ( replacement for pulled shoes), but both right side boots are messed up. They were a bit clunky but stayed on well and were easy to use. Love the epics. No rubbing, easy on and off after work off the original stiffness,stay in place. Will try the bares when I need another pair. Have a couple pairs of almost new epics for sale as young OTTB feet grew fast once shoes pulled and turned out. I am interested in purchasing the used epics if they are size 1 or 2. I will have to remeasure my horse to see which will fit. I bought size 2 cabellos, and they are what the guildelines say they should have, but they are too big.I bought epics in size 0 and they are too small. I would like to sell them, they haven’t been used. Do you still have the Cavallo boots size 2 avail? Just wanted to add that I love the Sabre Sneakers. I used them for a mare that had a series of unfortunate abscesses. They were easy to use, stayed put and held up very well even while galloping and cavorting in the field. THey saved me from having to keep this mare stalled for several weeks by protecting her soles and giving her some support on her bar tootsies. I would say that they fit a “round” type hoof better than a more “oblong” type of shape. I got my horse 5 years ago when he was 10 years old. He was barefoot when I got him but his feet looked awful. My farrier at the time put shoes on him and he held them well for a couple years. After that he just kept throwing shoes, and his feet were breaking, and they were hardly growing at all. He was lame all the time. I was just about to the point where I was really close to giving up(Arthur was 14)when I meet my current farrier. She has totally rehabed my horse, and his feet are doing great. The Marquis Boots are what saved him(well, besides my farrier). I love the Marquis. I’ve been using them for a little over a year now and I haven’t had a single problem with them. They are a little expensive, but I think they’re worth it. I love that each individual part of the boot is replaceable. They have great traction and if you need more, you can get studs for them. I also like that they have a little pad right under the frog. The air chamber, which is what holds the boot onto the foot, takes some testing to get it right for your horse. The boots come with a pump and you just have to keep trying till you get them so they don’t come off, and so they are comfy for your horse. The only issue that I have had(and its really not a problem at all) is that my horse overtracks so much from behind that he sometimes clips the air bubbles. I just got a pair of really big bells boots and put them over the Marquis, so now he catches the bells instead. He only wears them when I ride, and we are getting really close to starting to ride without any boots at all. I have been very happy with the Marquis. I’ll try to make a long story short, but like Christina, I think it’s important to tell the story. Next month it will be 18 years since I purchased my mare. The one note made on her PPE was that she had thin hoof walls and she needed to be kept shod. Okey, dokey. At the barn we were at for the first six years, the arena was dirt/manure and very soft on the hoofs, so I pulled her shoes every winter to let them grow out some. If I tried riding her out of the barn, her hoofs would break apart. The next place we moved had sand footing. I discovered I couldn’t keep her feet healthy barefoot even in the winter. The sand was too hard on them, so for the next 11 years, she was constantly shod. In the meantime, I’m studying nutrition and slowly developing a better diet for her and my farrier made mention that her walls were getting thicker and stronger, but she was still in shoes. The one thing I’d always heard is that although most horses needed shoes, they were always better off barefoot if they could get away with it. 1997, my mare came up lame and was diagnosed with ‘caudal heel syndrome’ on the right front only. After three years of very expensive shoeing, xrays, drugs and lots of TLC, the vet says he finally found something. A very minor bruised spot on her coffin bone. He advised a neurectomy on the right front, which was accomplished without further problems. It helped. By now I’m on my fourth farrier, having recently fired a two-time world champion CJF and changed to a part-time farrier, full time journeyman machinist who knows geometry and angles like the back of his hand. Next I noticed my mare’s right hoof (the nerved one) was longer than the left. I pointed this out to my farrier, who immediately went to work re-balancing the hoofs. Immediate relief and improvement in my mare. A friend of mine is a neurologist and she told me that this can happen when a hoof is trying to repair itself after injury. My mare has officially been diagnosed as hyper responsive. To clarify what that means – one time when Tom (farrier) was trimming, he inadvertantly trimmed the right 1/16″ shorter than the left. He noticed right away and we decided to leave it alone rather than try to fix it, for fear of making it worse. My mare went 3-legged lame for THREE WEEKS till that grew out. This is not an easy horse to shoe. Fast forward to 2004. We’ve moved again, my mare now gets daily turn out with a group of mares, but BO wants her hind shoes pulled. After 11 years, we pulled her hind shoes. She was ouchy at first, but she adjusted. Last winter (2005/06) we pulled the fronts and it was a disaster. Went extremely lame, did not want to leave her stall. Shoes went back on. August 2006 – purchased Old Mac G2’s (after discussion with farrier). My mare is now 23 years old. We pulled the fronts again, with the plan that if the boots didn’t work, we’d put the shoes right back on. She LOVED the boots. Now I had a new problem, my geriatric mare running around like a 3 year old in these boots. Anyhow, got past that. Since pulling the shoes, I’ve been treating her soles with Keratex Hoof Hardner and painting Thrush X on her frogs. She was very ouchy in turnout on the sand without the boots initially, but her hoofs have been healing day by day. Her soles are concave, her frogs are strong and recovering from their shriveled up state, her heels are opening back up. I turned out her today barefoot after walking her on the driveway. For the first time in 18 years, she SOUND without shoes or boots on hard surfaces and in the sand and her hoofs don’t have a single nick, they’re tough as rock. I have front and back boots for her, plus I’ve ordered the pads for the boots. I will continue to use them when I ride her. Our knowledge and the resources available to keep our horses sound has grown tremendously in a short period of time. The boots have been an absolute god-send. I would like to remind anyone reading this that there are still a lot of old-timers in our world who insist that horses can’t heal from ‘degenerative’ hoof disease. They are telling the truth as they know it from decades of past experience. We’re are truely blessed that we’re now able to resolve what used to be a death sentence to our horses. I have used Old Macs and Boas over the last 3 1/2 years while trying to bring one of my ‘selenium toxicity’ boys back to sound. He sloughed his front hooves 4X, as some will remember, and is now sound except for when on hard/frozen/lumpy ground. soles don’t clump up,there aren’t any fancy buttons to get lost, nothing superfluous to requirement, as it were. They are soft, but firm, and sturdy. And the price is really right. Lorna- is there any way I can contact you? We have two young horses with chronic selenium and am doing research on what works for bringing them back before we decide what to do. Thanks! I used Hoofwings Hoof Boots on my 1,000 mile horseback trip from the California coast to the Texas/New Mexico state line, mid-March to mid-June ’06. I was extremely pleased with their performance. My horse, Cisco, wore them for less than 50% of the ride time. The remainder of the time he was barefoot. He showed no signs of rubbing from the Hoofwings, except for minor hair loss around the back of the pastern joints – this after many hours of wear. had incredible traction on rock and pavement. They are very easy to put on and take off, using a hoof pick, if your fingers are not strong. We went to the bottom of the Grand Canyon in the Hoofwings, a very challenging trial. We were under the scrutiny of the Havasupai Indian guides, who were completly surprised by the Hoofwings’ outstanding performance. I loved how confident Cisco felt, and I was able to enjoy almost 500 miles of carefree riding. The Hoofwings are still servicable. Hoofwings makers Frank Orza and Mary Winn are very knowledgeable and kind people. They truly have hearts for the horse. I bought a pair of just the regular Easyboots, with no gaiter. Since these are my first ‘try’ with hoof boots, I wanted something inexpensive and with the least chance of rubbing. Without a gaiter, these boots really can’t rub unless they are somehow applied wrong or perhaps the wrong size. They were surprisingly easy to learn how to get on and off, although there was a bit of a learning curve. My first attempt at getting them on took about 20 minutes. Now, after some practice, it’s usually around 5 minutes to pick out the feet, put the boot on, tighten cable, and close the buckle. They’re also not too horrible to get off, either. I don’t even need a screwdriver, just occasionally use the hoofpick to help get them off. As for their actual use, I’m pleasantly surprised how well they’ve stayed on so far. I’ve only ridden on gravel, as that’s what I bought them for, but have done all 3 gaits as well as a few acrobatic maneuvers thanks to miss drama mare! They haven’t BUDGED, not once. I think folks who complain these boots come off aren’t tightening them enough, as I do have to use my boot to get the buckle down. If I can get it down with my hand, I think it is too loose. Maresie is very comfortable in them, and can’t even really trot comfortably on gravel without them. With them, she’s totally confident and MOVES OUT, it’s great! The breakover on them I’m still wondering a bit about, if it needs to be brought further back or not. If I decide it does, I may ask my farrier to file them a bit for me or something. But we’ll see! Overall, best $70 (with shipping and all) I’ve spent on my horse. I’m kicking myself for not trying these sooner!!! I no longer shoe my horse Kub because after 10 miles of trail riding he was pulling his shoe off (he has arthritis in his hocks so his back legs tend = to go straighter when tracking). I tried a few things (easyboot – it’s not easy!!! And the easyboot bare/epic (can’t remember which) – with 3 people trying to get this boot on, forget it). I spoke to someone who does long distance trail rides and has used Old Macs and Cavallos. He actually liked the Cavallos better (less parts to break off). So I tried them and have been using them for 2 years now. I love them. My guy goes barefoot in his fields but I put the Cavallos on for trail riding, lunging etc. We go for 15+ mile trail rides (plus hunter paces) with them, never have to worry about muddy areas(how many people look down to see if their horses lost a shoe after going through a muddy section) and he jumps well with them on (last fall we did quite a few 3 footers in Dover MA.). Their web site is http://www.cavallo-inc.com/horseboots.html but you can get them through Dover Saddlery or (without having to pay for shipping or taxes) through KV Vet or Valley Vet. A pair run $119. You can put them on when the horse has shoes on but you do want to talk to them about it since you’re supposed to do something (put something between the shoe and the hoof boot). Since I don’t ride that way… I’m not sure how it goes. These hoof boots are really easy to put on. All the straps etc are Velco. No tools needed. They are awesome (especially when you have a horse that kept pulling shoes off, it was really nice to find something that I didn’t have to worry about). for $20/a piece instead of buying totally new boots. Ah – the quest for the perfect hoof boot! I have a pony can’t keep metal shoes on so I got some Old Mac G1s and these have served well – they have never come off and as long as I use the pastern wraps they don’t rub. The main problem I have with them is riding through mud – my pony panics now as the boots make it hard for him to get his feet out and they get in a real state. I now remove them for the muddy bits but it’s a bit of a fiddle. I have galloped in them but one did break and although I have had it repaired I now remove them before fast work as that’s always on grass. 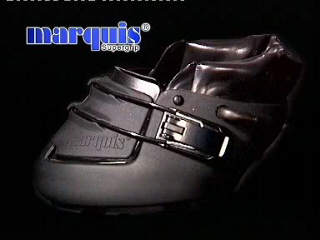 I did try the Marquis boots but hated them! I think this is mainly because my pony has very round hooves and however hard I pumped them up they weren’t going to fit properly. I lost the fiddly valve caps almost immediately and had to carry the pump everywhere – not for me! I think Gill is right with being a quest! Particularly insightful with all the comments and discussion on the top end hoof boots. Sometimes you’re just lucky finding the right one, like a silver slipper to see if it fits! & I’ve found a site that just has those Horse Boots for me. Generally though, the consensus among my equestrian friends is more towards Easy boots, however a lot of factors need to be considered, most noticeably the terrain and the riding disciplines. Christina. Yes that is what I meant. I’m just glad my horse riding is better than my posting of Horse Boots (I’ll try again)! So apologies. But that is what Choc is in now. However I am considering some SMBs in the future too. I am currently using the Old Mac G2’s. I can tell you they are difficult to get on, but they do stay on through just about anything including deep mud,water,rocky terrain. My horse doesn’t seem to mind them. They are more clunky compared to most though. My father has a pair of Boa Boots. These are much more simple to put on and have a much more low profile look. However, they do not offer the tread the Old Mac’s do. I think I will try the Cavallos next. These seem the simplest so far to put on and only measure by length. Trying to find hoof boots for my newly bare foot mare. She has raised scarring on her pastern so Swiss boots, although fitting her hoof perfectly, would have rubbed this area. Has any-one any ideas? Not sure if G2’s will rub due to the pastern strap. Easy boots are below the hairline but she’s not the most patient of mares to try anything too fiddly! Hi – no, you are the first person to ask a graphic format question! I see you have a ‘blogspot’ blog. This blog is a ‘wordpress’ blog. Those are the two main sites that offer free blogs. The format is one that is pre-made and offered by wordpress. They call it a ‘theme’, and this one is called ‘Currents’. I started with blogspot but changed to wordpress because it offered so many more graphic options and as you can see this is a photo heavy blog. I recently got a mare off the track, she had her shoes pulled and immediatly swelled up, her feet seem pretty brittle, I put her on hoof supplements. I really would like her to be able to go barefoot. I’m a 3 day eventer so I need boots that would be good for everything, dressage jumping and cross country. Any reccomendations? Hi there. The first thing you probably need to do is give your mare some time off to adjust to being barefoot and let her feet grow. TB’s on the track tend to be shod with low nails and thus can have short hoof walls and thin soles, so she will need time to build that up. The brittleness is also something that is a result of shoeing, when new hoof wall starts growing in, it should be of better quality. The supplements will only work on the new growth, not on what is already there. The best you can do is to encourage the feet to grow out as fast as possible, largely with a lot of turnout and exercise to get blood flowing to the feet. But, boots should help so that the new growth doesn’t all just wear off. What do you mean she immediately swelled up? Her legs did, from having her shoes pulled? Well that is a sign that she had reduced blood flow to her feet, and now has increased blood flow but it is not getting enough stimulation to get it circulating. I would, again, encourage exercise in boots, and possibly cold hose the legs or apply a liniment. As to which boots, you are going to have do more research to see not only what works for each phase, but what is allowed in competition, and what will fit your horse properly. Last I heard boots were not allowed in dressage competition though that could have changed. You want to find boots with some traction for cross country. For stadium you may not need boots. Well trimmed hooves actually have a lot of traction if the bar is trimmed properly. But you have at least 6 months of new hooves to grow out before you can even think about that. I would think about boots in terms of transition and not necessarily competition. When she gets more comfortable, see what you have and maybe you can ride without boots – if you have a good trim that is not out of the question. Lots of people are eventing their barefoot horses especially at lower levels. I’m seeing a lot more BF horses at horse trials than I ever did in the past. Just for giggles check out the Easy Boot Gloves, for jumping. Other boots can be way too clunky to allow proper jumping, as well as breakover. My Morgan mare has now been barefoot for 3 years, wearing boots when needed, I have gone thorugh several with varried success. I started and keep returning to cavello simple boots which have never come off nomatter how deep and sticky the mud or how fast or steep the terrain, They are klunky and noisy, better with the pastern wraps and or pads but still like galoshes, I tried Renagades custom fitted, she loves them, quiet and form fitting but we do manage to get out of one on almost every ride, My mare has very square fronted wide feet that are a smidge wider than long. The next boot has been the Easyboot Glove, again the mare loves them, they are Quiet and do not rub and fairly easy to put on but we have managed to rip out the back of the gaiter when trotting up steep trails, the hardware just rips through the plastic, they have been easy to repair and i still use them alot. the Caavello simple boot remains the most trustworthy and secure if rather heavy, I also find them a pain to clean, the massive amount of velcro and leather are more labor intensive to care for, next I plan to try the new Cavello sport boot which is more synthetic, may be lighter and easier to clean. I do think my mare is better off barefooted, I ride year round in deep mud and wet rocks in the winter and hard dry rocky summer trails, many of the shod horses are ouching along on the rocky areas where my girl is happy striding out no matter what the terrain, she is barefooted in turnout and when on the less harsh rides but I keep atleast front boots in my saddle bags on every ride just in case the going gets to rough. I keep hoping to find the perfect boot. even having bought 3 diferent sets of boots I have certainly saved money over what conventional shoes would have cost over the las 3 years and I think my horse is happier and healthier. Thanks for posting this very helpful information; I happened to come to your blog just searching around the web. Please keep up the good work! I have recently got a new 5yr TB mare she was bare foot when I got her and I am thinking about keeping it that way but I do eventing and I am not sure which boot is the best to use so if you have any suggestions that would be great. I hope my experiences may be of use to others. My two 16.0hh Welsh Section D’s are now unshod, and have tried a range of hoof boots over the past three years, starting with Boas. I first bought one as a spare tyre when a hind shoe had to be removed. Easy-peasy to fit, stayed in place throughout all paces, roadwork and off-road, I thought it was wonderful! But, my round & wide-footed gelding knocked a hole through the toe within a fortnight! I now realise that to get him into one wide enough, he was actually wearing a Boa far too long at the toe…. I have since have heard of horses’ coronet bands being bruised or cut from the pressure of the fastening dial, and one poor animal who was fine wearing a full set of Boas on the road, but as soon as ridden up a grass bank, started skating, semi-fell, lost his rider, panicked and took off – legs everywhere. He badly pulled all four tendons, and that was quite enough evidence for me. My mare went unshod first, her hoofs like pincushions, in need of a rest from shoes, yet still needing exercise – dilemma! So I tried Easy Boots, both Epics and Bares. The Epics are not suitable for our mix of surfaces and terrain. Altho ok on tarmac roads, they were very slippery on steep grass and also on hardened brick-dust bridleways, surfaced by Council PROW. But we do live in a very hilly area, and the Council seem to prioritise cyclists’ needs above horse riders’ on the bridlepaths!! After conversation with manufacturers, I changed the fastening on the Bares to the standard lever clip, because the bungee was so awkward to fit… these boots performed well enough on my mare’s forefeet (but tended to spin behind). However they proved slippery on slick, wet grass, either at speed, on a gradient or turning; several times the gaiter-neoprene got ripped; and sometimes (for no apparent reason or difference in adjustment)we found the lever clip sprung up. Maybe my cobs are heavy on boots (although they were average on horseshoe metal), but I found that the soles of Easy Boot Bares wore low and smooth very quickly, with my consequent concern for traction, as described. My big gelding has much wider, rounder feet than the mare, so none of the Easy Boot range fit him properly. To get him into a pair in front, he finished up with a large amount of clodhopping toe space, the boots wore thru in no time because he was trying to ‘breakover’ as normal, and with hindsight, it’s all credit to his Welsh action and surefootedness that we didn’t trip up. So we tried Old Mac G2s. I would forget the sizing guides on ALL these makes of boots and try to borrow / hire pairs or sets to try for size, first. The beauty of the Old Mac boots is that they are very flexible, he can happily wear a smaller pair in front (size 9) than his size guide suggests, thus minimising the amount of unnecessary toe space. And has worn them very comfortably and generally successfully for nearly two years. We swopped the mare into these, too, as a result. I should dearly like to try Renegades for this mare (I understand they are not made anywhere near large enough for my gelding), but cannot find a UK source or fitter who will agree to sell these to me unless they also become my regular farrier – what a pantomime. Any other advice would be welcome. I have been reading this with a lot of interest as I’ve just joined the club on the conquest to find the right hoof boot. After trying various sizes of the Easyboot Gloves as I like the design, there was no way I could get them to fit my arab gelding’s round front feet. I have used Old Mac’s G2 before with success on another arab hence I decided to try them. For the first 3 days they were fine while trying to break them in (starting with walking, then a little long rein, then some short riding in the school) but on the 4th day they rubbed him raw to the point of bleeding on one front foot. He now refuses to go anywhere near them. I don’t really know what to try next, and it’s becoming very expensive, but I need boots for his fronts while we go through the transition. I’m not planning to keep him barefoot in the long term, but as an x-racer his feet are not good and he’s not got enough hoof wall for a farrier to put ordinary shoes on. So we decided to pull all shoes so I can treat the white line disease and let the wall grow out before we shoe again. Biggest problem is that he’s so lame on the fronts that I can’t ride and as we all know, he needs the exercise to build up the hooves. Dilemma! He’s turned out at night, brought in to the stable during day time and he loves it in there as it’s soft rubber matting. He has round hooves, which makes me think that none of the Easyboot’s that come underneath the hair line will fit. But the ones that come up, like the Old Mac’s, will rub as he’s so sensitive. So, where do I turn from here? Just found the website – the info is very helpful. I use Easyboot Bares (with pads) on my Akhal-teke cross and they work beautifully. They are a pain to put on the first time, but not a problem after that. I love the Bares, but they do not fit every horse. I also have a 16.3hh Quarterhorse with big, round, flat feet and is prone to bruises, and the nice people at Easycare said none of their line of boots would fit him, including Old Macs, so I have ordered some Cavallo Simple Boots to see how that will work. I’ve never heard of Hoofwings before reading this website, so I will also look into them. I have not shod my horses in 5 years, nor will I ever shoe them again. After years of problems with traditional farriers not trimming very well and sometimes causing serious lameness, I finally found a natural trimmer who does an excellent job. I am just a recreational trail rider, but we have very rough, rocky, mountainous terrain here and the horses are much happier with boots on the front. I’ve been leasing/training a 12y/o 14.1pony for just over a year now. I started riding him in June of 2009. He went from being a trail horse with limited experience in anything, to a hunter show pony but made the adjustment perfectly. He was wonderful, but around October of ’09, he went lame for a month and a half and we could find absolutely nothing wrong with him. However, after that he recovered and has been fine since. A few days ago (start of October) He started acting odd again, just like last year, only this time I noticed that he was really ouchy when walking up the barn’s gravel drive. HE’s been barefoot his whole life, and has done wonderfully, so I really don’t want to shoe him. I was looking into the easyboot bare, but if not those, then I’d like to go with the cavallo. Out of the two, which would be best for a pony who does dressage, hunter, cross country, and trail riding. Ridden 5-6 days a week. Oh, also his hind feet are smaller (by3/4 of an inch) than his front. Do the boots sold on the easyboot website come in 2 or 4? I have a mare with very round feet and I am having a horrible time finding boots for her. I’ve tried two types of easyboots (edge, epic) and neither fits. Size 1 is too small and size 2 is too large. My trimmer recommended size 2. The stay on most of the time as long as I don’t do anything faster than a trot. I was on a very long ride today and had to put the boots back on 3 times. I really hate these boots and would like to find something better that would fit a horse with round feet. However, I dread the thought of buying another pair just to find they don’t fit. It almost makes me want to go back to metal shoes! the original Old Macs seem to be the roundest hoof boots out there. Hi, my Quarterhorse has very round, flat feet, and I’ve found the Cavello Simple boot fits round feet well. I tried Easyboot Bares and love them on my other horse, but they didn’t do well on Cisco. Easyboot told me that none of their boots (Old Mac included) would really fit his feet well, that’s why I went to the Simple boot. Good luck! Has anyone out there had any experience with the Renegade hoof boot. It was recommended to me by an endurance rider , but not sure which boot to try on my Arab gelding.. I am concerned with proper fit and them not coming off. Thanks for any help. I have been using Renegades for approx. 3 months on my two horses (whose feet are both very different) for trail riding and I have been very happy with them so far. In particular I like that they are not sweaty like the closed in boots and are easy to put on and I haven’t had any come off yet. Best thing is they dont require any break in time, they are comfortable straight away and no rubbing. I used the renegades for one riding season and really liked the boot except for two things. My mare wore a hole in both front toe areas after just one riding season. Second, I tried to adjust the boots to loosen the cables and both the boots pin screws striped to make them none adjustable so now the sit with a worn toe and will no longer fit since my mare hoof expanded a bit with being barefoot. Can anyone recommend me a good pair of boots for trail riding? Approx 4 hours a day, several times a week lots of different terrain including streams, some fast work. I have heard that boots cause the hoof to sweat and can cause thrush, is this true? I had trouble with some of the closed in boots sweating and causing thrush but no problem with the Renegades. See my previous comments to Beth regarding Renegades. Some boots that could work for you depending on your mare’s foot shape are the Renegades as you say, EZ Boot Trail (new) Cavallo Simple, or the EZ Boot Glove. The Glove are the least obtrusive and fit the closest so might be the most suitable for jumping. However, ‘strength’ isn’t an issue after de-shoeing. It’s the white line that usually is compromised by long term shoeing and needs to grow in more closely attached. Also the trimming itself could be at issue and unforgiving terrain exposes inadequate trimming. my tb mare is barefoot and i normally use boa boots on her. i find they fall apart easily. i live in the mountains of spain and i guess they dont cope well with the rocks. she has round hooves. what would anyone suggest? I have both the Cavallo and Old Macs(new style). I like the easiness of the Cavallos but feel the Old Macs are more durable. Right long story to explain… we recently saved a little section A pony after a 13 year old had her. She belonged to the riding school I was at and has always suffered from chronic laminitis. This girl purchased her in April 2011 and although was told to keep to light work, pushed this little pony too far. She would take her around the town barefoot and then bring her back and make her jump for an hour (you could see the pony was struggling). She then shod her and didnt keep on top so the hooves grew over. Molly (the pony) then became very lame so the girl handed her back as she ‘lost interest’. We agreed to take her on but cannot afford vet bills at this moment in time. I went to look at her feet as she seems to struggle on hard ground, as our yard has stones she really suffers. I heard she apparently has dropped soles due to the laminitis but her frog seems to give off an odour. Ive been washing and cleansing her feet daily and applying antiseptic spray directly to the frog and she is improving as can now run around fields. However she does still struggle when it comes to the yard, so I’m trying to find a hoof boot that I can turn her out in just until she’s more sound on her feet. The fields can become muddy during these winter months so really need something that can cope with weather. Any ideas please? Try small size Old Macs G2, you need to measure widths / lengths of hoofs to match boots (which are generous). Buy and fit at least two studs in each boot, and also buy and fit their soft ‘Comfort Pads’ into sole of the boot. The pads will give her a lot of relief when walking across hard / uneven ground, and the studs will prevent her skating like Bambi on ice in slithery fields (I’ve been hunting in mine, although would advise some caution). Wash the boots thoroughly on a regular basis, they can be put back on wet. If you want to talk experiences through 0114 2301962 – I must have tried every brand of hoof boot on the market and wouldn’t like to see you spend or make mistakes that I have! I’ve used the Easyboot RX boot, which was designed exactly for horses/ponies who are recovering from hoof problems. As long as it is the right size, it shouldn’t come off in the pasture (mine didn’t) and it will make her very comfortable, I think. If you are riding, you should look at the other Easyboot styles – they are very good at customer service and will help you find a good fit for your pony. I use the new Easyboot Trail on one horse and the Easyboot Bare on my other horse – they have very different feet. They are a little pricey, but last for a long time. I don’t blame you – I rescued a Shetland pony once and had her for 18 years – she died at age 34 and was very loyal. I still miss her. Perhaps I should have added to Molly’s rescuer, if her feet are smelly and necrotising, you do need to try to allow them to dry out. Ideally want that pony out of her boots and muddy fields overnight, onto a dry bed. Very deep straw, or rubber mats with shavings or shredded newspaper probably best. Whilever her feet are wet, they are softer and prone to bruising. Laminitis Clinic sell ‘Solution 4 Feet’, but it’s pricey, so try scrubbing soles and frog with thick household bleach or dairy bleach when you get her out of the paddock, wash it off, let her dry out in the bedding before booting her up for turnout. If that’s a Welsh pony, chances are she’s got rounded hoofs, which unless the founder’s altered their shape drastically, don’t seem to be as well served by the Easiboot ranges (my experiences). Old Mac boots are much more pliable, My big Section D has v round, short hoofs, the ‘correct’ size for his measured width leaves a huge space at toes in Easiboots, but he can get in a size smaller than measurements suggest in the Old Macs – they don’t rub, stay put through mud, streams, snow, galloping etc, even bloodhounding, whereas the ‘correct’ size just spun off. Re state – if field’s slippy DON’T turn out in hoof boots without studs fitted – risk a serious accident and panic. Good luck, sounds like you’re doing well to have got her paddock sound after all that history. Nic Barker and co writer have produced a v. good book on barefoot, one case study in there would be of real interest to you. Old Mac’s didn’t fit either of my horses at all and they rubbed around the coronet band, no matte what size I tried, and I tried many. I still think the Easyboot RX would be the best solution – it was built and designed in accordance with vets for EXACTLY this type of problem, but it’s not for riding. A friend of mine has a seriously laminitic Morgan with very round feet and she uses the RX to rehab her – but a really good barefoot trimmer is vitally important as well. Once my friend changed to a better trimmer, her mare has not had an episode of laminitis in almost a year. Now she only boots her with Easyboot Bares (size 0) to go out on our gravel roads and never loses a boot. I guess I’m trying to say you have to try several different kinds until you find a good fit, because they all have very different feet and we all have different experiences. I’m having trouble with my Cavallo hoof boots, he had the correct size for the length of his hooves but even the Sport is too wide and flies off when he goes into extension or gets silly. Their suggestion is to buy the smaller size but as they are shorter than his hoof surely they will rub. Anyone any suggestions? I’ve already commented on my (experience-based) scepticism about the official sizings of any of the hoof boot brands, and strongly recommend that you TRY both sizes and makes before making expensive mistakes. And it’s cost me a small fortune to reach this wisdom! There are now a couple of retailers in Britain who will hire various boot brands out, which is much more sensible whilst you’re trying to establish what works for your horse. For example, Cavallo boots are quite unyielding in comparison with Old Macs. My own horse measures at least one ‘official’ size wider than he actually wears in an Old Mac, but can get away with this smaller size because the boot is much more flexible than either Cavallos, Easiboot ranges or even Boas (and, has he tried all these out!). In his ‘correct width’ Old Mac, there is a huge amount of spare toe space (unwanted length), and the boot simply spins off. You obviously have the opposite problem (width / length proportions), but the principle of greater flexibility as opposed to rigidity in the boot will enable better accomodation of non-standard hooves. Using neoprene pastern gaiters (now supplied with Old Macs) and /or the Comfort Pads innersoles, you can make a big difference to fitting any hoof boots. I believe the Renegade range, which can accomodate shims to take up space, may be even better to fine-tune, but they just aren’t made large enough for my own horse. If you pursue Renegades, TELEPHONE the Landers (designers), have a proper conversation, e mail PHOTOGRAPHS of your horse’s hooves with visible ruler held across them, so they can ascertain for themselves the appropriate measurements, and advise you accordingly. You may find you have to order Renegades directly from USA, so make sure you eliminate any misunderstanding before investing in this. When I had similar problems with my Cavallos the gel inserts really helped. Also I used my OldMac gaitors in my to big Cavallos in one of my mares. Hi, thank you for all your comments and advise. I have had both the wrap and gel pads in the Cavallo but still fly off. I have now swapped to the Boa hoof boots and they fit much better. £65 +£7 postage and packing, collection can be arranged from BD17. I have a QH mare I bought 2 years ago (9 yo now). She had dishpan feet esp. In the front. I tried reg. Shoes for a year for corrective purposes however she never kept them on. She tore her hoof wall off at one point. My farrier was a little annoyed. I had an accident in the fall and just let her go barefoot. I also have an appy 4yo who is being started now. I have tried the cavallo simple boots on my mare… they rubbed her pasterns raw. She has LONG sloping pasterns as well and is a BIG mover for a little horse. I just started using Easyboot Epics and she seems to LOVE them. 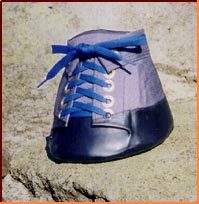 I always had issues w/the old easyboots and lost them ALOT back in the old days. These so far have stayed on through deep sucking mud. Also great for rocky ground. I use the comfort pads in the fronts for extra protection. Shes trudges along at her normal fast walk and trots without issues. MUCH BETTER THAN STEEL SHOES. I also decided to use them on my little appy but havent pushed the limits w/him yet. They fit himgreat and he too moves much quicker and more comfortably w/the epics. Overall though I havent tried others due to being worried about how they end around the pasterns and most likely will rub mylong pasterned mare raw, THE EPICS stay on and are great through rocks and mud. Cavallos arent for us. The only thing w/boots is hard ground hills are a bit scarydue to traction issues. I may try studs? But not sure yet. Fit some studs!! Preferably before you have a nasty accident, and blow your horse’s confidence. You can take the studs back out, or may prefer to keep two sets of boots for different conditions. Studs ridden on tarmac pavement are very unyielding and can even cause lameness. Contact the manufacturers and get their stud recommendations for the specific Easiboot model that you get on best with. We found the Easiboot Epics too slippery on our gradients and surfaces, although Bares (converted to the lever fastenings for ease of use) were better for grip. I have been x country and bloodhounding in Old Mac G2s, each boot fitted with two studs at heels, but you could fit more than this for extra traction. Apparently Renegades (which fit below the hairline, and shouldn’t rub your mare’s pasterns) can be fitted with multiple studs for ice polo and racing – have a look at their information site. Please don’t risk an unnecessary fall! good luck. I have a client with a big Percheron looking for some boots that will suit her needs, since her horse gets so much exercise he wears faster than he grows. She rides 50+ miles a week. Any suggestions? I use the Easyboot Gloves on the fronts and Easyboot Bare on the hind legs. I do a lot of mileage but my horse is an Arab and probably a bit lighter on the feet than a Percheron. My friend uses the Cavallo hoof boots on her Irish Draught and likes them but only does about half the mileage that you do. The Saddlery Shop on line hires out hoof boots, this could be a good option for you to try them. http://www.thesaddleryshop.co.uk. They also sell off the trial pairs on ebay a lot cheaper. My horse does similar mileage, sometimes more (especially now: lighter nights and desperately trying toward off threat of lush-grass laminitis!). He weighs c.700kg, girth circumference 86ins, 16.hh Welsh Section D – with a lot of action and energy. He has round hoofs, broader than long. Have tried various makes and models, including Cavallo, Easiboots, Boas. Best solution for him, used for over past three years, is Old Mac G2s, size nine in front and eight behind, with red comfort pad innersoles and neoprene gaiters all round. Been hunting, through rivers, mud, snow etc, plenty of tarmac roadwork, but DO use studs for slick or slippery surfaces. We go through a lot of pairs, in his case the hinds wear out about twice as fast as the front boots, but have found this brand noticeably more durable than any of the others we tried. There is a very similar boot to the Old Mac G2 (not tried it myself) in black and tan, but without the inner, figure of eight strap which goes around pastern / fetlock, and is sold without neoprene gaiter. It retails more cheaply, might be worth a shot? None of the manufacturers recommend their boots for this kind of mileage – except the American ‘Renegades’, which aren’t made big enough for my cob – so you can expect to keep having to replace worn down pairs. I donate mine to local Animal Sanctuary, because they still have some life even when flat. At least we haven’t had any breakages with Old Macs, whereas did with various Easiboots and Boas, but they’re not best shape and fit for him anyway, so maybe why they got more easily damaged in use. I need boots for an 11 hand pony Poa with laminitic feet. Can he stay in the boots for 8 hours a day for turnout? Also for driving him on short trips around the property?